The ordinary, once commonplace structures and objects tend to bear a distinct imprint of time and place. A piece sanctified by tradition and habit turns into a unique memorial of the past. When we have to reconstruct the past through a handful of preserved artifacts, the once ordinary cultural phenomena, alongside with the outstanding cultural achievements, turn into priceless testimonies. Such was the fate of the synagogues that a hundred years ago were still to be found in each and every town in the Western Provinces of the Russian Empire. Today, almost none of these numerous synagogues are in existence. 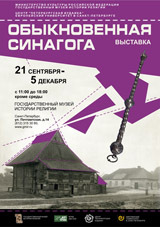 The First Jewish Museum in Russia. Photographs into the ‘Album of Jewish Artistic Antiquities’. "Brothers and sisters in work and need!" Jewish workers and craftsmen before the Revolution. «Young man’s experiences in photographic works». Artistic photographs by Solomon Yudovin. 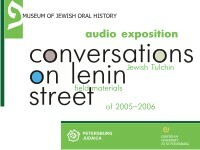 Conversations in Lenin Street: the Jewish Tulchin in Field Records of 2005-2006. Photographs from the Museum of Petersburg Jewish Historical-Ethnographic Society. The fragment of the photographic collection from the Museum of Petersburg Jewish Historical-Ethnographic society, kept in the archives of the of "Petersburg Judaica" Center, contains 320 photographs. They are of different origin, yet the nucleus of the collection, both quantitatively and qualitatively, consists of photographs made by Solomon Yudovin (later, a well-known Soviet draughtsman) during folklore-and-ethnography expeditions of 1912-1914. Semion Akimovich An-sky, a writer and a public figure, organized these expeditions that became the turning point in the studies of the culture of Eastern European Jews. Altogether, in the period of 1912-1914, An-sky conducted three expeditions to towns and shtetls of South-Western Ukraine (Volyn', Podolia, and Kiev provinces). WWI and the revolution prevented further expeditions. The destiny has disposed it so that these expeditions left behind not so much the reports, but the legends: their materials were hardly ever published, the collections were destroyed and disseminated among various museums and archives. As a matter of fact, the major result of these expeditions was the famous drama The Dybbuk written by the "father of Jewish ethnography," S. An-sky. The plan to publish of the photographic album that would reflect various aspects of Jewish people's life and art was not implemented — in spite of the fact that, according to memoirs left by A. Rechtman, a participant of the exhibitions, their photographic archive contained about 1,500 photoes. Materials of An-sky' expeditions, including photographs, were preserved in the Museum of Petersburg Jewish Historical-Ethnographic Society, which was situated in the building of the Jewish almshouse founded and named after to A.M. Ginzburg (5th Line, Vasil'evsky Island, H. 50). In 1929 the Jewish Historical-Ethnographic Society and its museum were closed, and the photographic collection was partly distributed among various museums of Russia, Israel and the United States. Presently "Petersburg Judaica" Center holds the largest fragment of the photographic collection from the Museum of Petersburg Historical-Ethnographic Society. The "life course" of these photographs is rather curious. At least since the middle of 1950s they were kept by the famous artist Natan Altman, who used them for his illustrations to the "Selected Works" of Sholem Aleichem (1957). It is not known where these photographs were kept between 1929, when the Jewish museum was closed, and 1957, when they were used by Altman. Yet one can assume that it was Yudovin who handed them overto Altman, for Yudovin had been the main curator of the museum till the very end. It is known that the closing of the museum was rather chaotic, and Yudovin, who lived in the museum building, succeeded in preserving a number of materials at home. Later he gave a part of them to the Museum of Ethnography of the peoples of the USSR in Leningrad (now Russian Ethnographic Museum), and another part was sold by his descendents to various collections. No doubt, the major part of materials hidden by Yudovin were pictures; the more so, because he himself was the author of the largest part of the photpgraphic collection, Yudovin (as well as later on Altman) made an extensive use of compositions and motifs of this collection in his graphic works. The fragment of the photographic collection from the Museum of Petersburg Jewish Historical-Ethnographic Society, kept in the archive of "Petersburg Judaica" Center, contains primarily Yudovin's expedition pictures. They represent inhabitants of Ukrainian shtetls; Jewish artisans and workers (largely due to An-sky's socialist beliefs); synagogues and monuments of Jewish folk art. The photographs catch the instances of expedition work, portraits of its participants, the exhibition based on the results of the expedition, prepared by An-sky in 1913. A series of exhibitions dedicated to archival photographs from the Museum of Petersburg Jewish Historical-Ethnographic Society allows casting a glance into the world of shtetl on the eve of the impending catastrophes of the 20th c.
David Noevich Goberman (1912-2003) - an outstanding artist, photographer, art critic, leading researcher of the traditional art of Moldavia and Western Ukraine. He owns pioneering studies decor of carved tombstones of Jewish tombstones, made in 1950-60-ies. The funds of the PI are all the photo archives (prints, negatives) Goberman of Jewish folk art. Of particular value to this collection gives that the photographs depicted Goberman monuments from cemeteries destroyed in 1960-70-ies., Including such significant as a cemetery in Chisinau and Snyatin. Also available is the PI graphics (monotypes, drawings) Goberman explanations of Jewish folk art, as well as a large collection of his paintings and graphic works. Jewish Artist in Leningrad / Sankt-Petersburg. Natan Altman, Solomon Yudovin, Anatoly Kaplan, David Goberman, Leon Nissenbaum, Anatoly Zaslavsky, Aaron Zinshtein, Tatiana Pogorelka, Leonid Grolman, Asya Lukin.